Trainer Philip Fenton has been banned from racing for three years after he was found in possession of banned anabolic steroids. He was called to an Irish Turf Club hearing after being found guilty at a district court hearing last month of having banned substances. A cardboard box packed with 25 bottles and containers of animal remedies was found at his County Tipperary yard. Fenton won the Irish Hennessy Gold Cup with Last Instalment in February. The banned substances were found hidden in an equine spa by officials from the Irish Department of Agriculture in January 2012. Among them was one kilogram of the anabolic steroid Nitrotain in a paste form in a black tub - enough for 250 doses - and a 20ml bottle of a second performance-enhancing drug, Ilium Stanabolic. Fenton was fined 6,000 euro (£4,748) as well as being ordered to pay a further 4,200 euro (£3,324) in costs following the case. 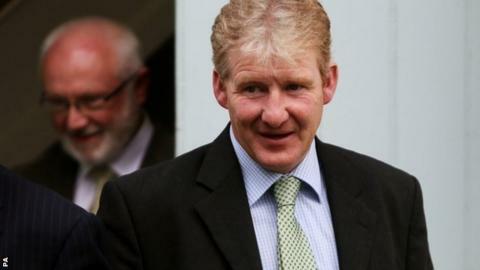 "As a champion amateur jockey and as a successful trainer, Philip Fenton has been a well-known figure in racing on both sides of the Irish Sea. "Horses he has trained to big-race victory include Dunguib, Last Instalment and The Tullow Tank, but all reputation gained now lies in shreds at the conclusion of a scandal that broke just before the Cheltenham Festival. "No horses tested positive for anything, but Fenton's conviction in the courts forced the authorities to act to protect the sport's image." The Cheltenham Festival-winning trainer did not give evidence in the one-day hearing at Carrick-on-Suir District Court and refused to explain afterwards why he had the steroids in his yard. Fenton's disqualification period from training horses will begin from midnight on Friday, November 28. On 1 March next year, he will be disqualified entirely from any horse racing environment.